Leaders Express Admiration, Sadness for Billy Graham - Integration Through Media ....! 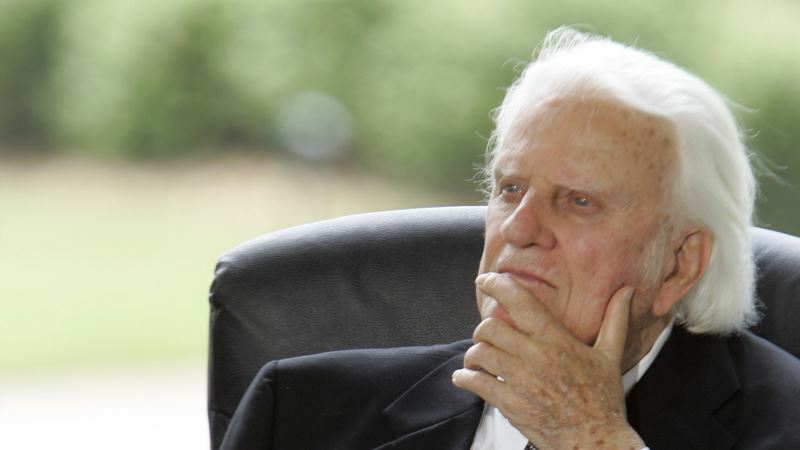 (VOA): Leaders expressed admiration and respect for evangelist Billy Graham, who died at his North Carolina home Wednesday morning. President Donald Trump In a tweet, President Donald Trump said: "The GREAT Billy Graham is dead. There was nobody like him! He will be missed by Christians and all religions. A very special man." Vice President Mike Pence "Billy Graham's ministry for the gospel of Jesus Christ and his matchless voice changed the lives of millions," Pence tweeted. "We mourn his passing but I know with absolute certainty that today he heard those words, 'well done good and faithful servant.'" Former President Jimmy Carter "Rosalynn and I are deeply saddened to learn of the death of The Reverend Billy Graham," Carter said in a statement. "Tirelessly spreading a message of fellowship and hope, he shaped the spiritual lives of tens of millions of people worldwide. Broad-minded, forgiving, and humble in his treatment of others, he exemplified the life of Jesus Christ by constantly reaching out for opportunities to serve." Former President George H.W. Bush "Billy Graham was America's pastor. His faith in Christ and his totally honest evangelical spirit inspired people across the country and around the world. I think Billy touched the hearts of not only Christians, but people of all faiths, because he was such a good man. I was privileged to have him as a personal friend. He would come to Maine to visit with Barbara and me, and he was a great sport. He loved going really fast in my boat. I guess you could say we had that in common. Then we would come home and talk about life. He was a mentor to several of my children, including the former president of the United States. We will miss our good friend forever. North Carolina Gov. Roy Cooper "Billy Graham was a strong, humble, positive and passionate North Carolina man of faith who made a difference in the lives of so many. Rest with God, Reverend Graham," Gov. Cooper said in a statement. Sen. Lindsey Graham "One of the greatest messengers of Christ has gone to his heavenly reward," Sen. Graham wrote in a tweet. "Dr. Graham spread the good news to millions across the world and led a life beyond reproach." South Carolina Gov. Henry Mcmaster "Rev. Billy Graham dedicated his life to preaching the Gospel, touching the lives of millions across the world," Gov. McMaster said on Twitter. "It is bittersweet to hear of his homegoing this morning, as he will be missed, but we know he is rejoicing with his Savior right now." Anne Graham Lotz In an online post titled "Daddy is at Home," Graham's daughter Anne Graham Lotz said she did not think of him as a public figure. "I think of my Daddy. The one who was always a farmer at heart," she wrote. "Who loved his dogs and his cat. Who followed the weather patterns almost as closely as he did world events. Who wore old blue jeans, comfortable sweaters, and a baseball cap. Who loved lukewarm coffee, sweet ice tea, one scoop of ice cream, and a plain hamburger from McDonald's. Who was interested in everything and everyone, from the small to the great." Mike Huckabee, Former Arkansas Governor and Presidential Candidate "When the news broke that Billy Graham had died, my first reaction was 'there's a real example of "Fake News.'" Billy Graham has passed from this life for sure at the age of 99, but he is anything but dead. He is more alive now than ever before, and living a life that will never end." North Carolina Sen. Richard Burr "I was incredibly saddened to hear of the passing of Reverend Billy Graham this morning. America's Pastor was an inspiration to millions of Christians in our country and across the world. While his humility, faith, and booming voice will be sorely missed, today, he is at peace with God."